Music is a universally recognized language speaking to people across many different cultures and generations. For some, music is their livelihood; for others, it is- as Shakespeare called it- “the food of love.” Musical themed tattoos are often an expression of one’s passion for music, whether they’re a musician or a music connoisseur. 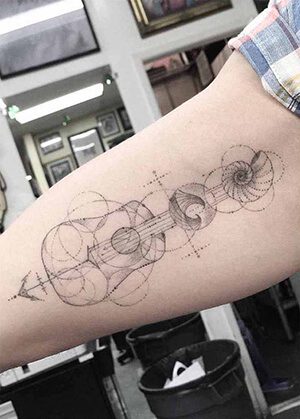 Below, we’ve compiled a list of suggested musical tattoo meanings. 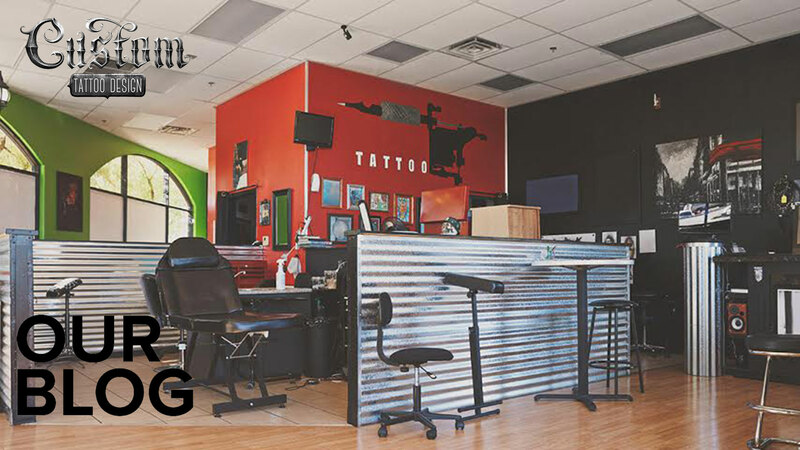 Check them out: you may find inspiration for some of your own tattoo designs! Compact Cassettes: commemorating the 60’s to the 90’s, these rectangular music devices are a celebration of retro music listening. Created in Belgium in 1962, these devices would come either pre-recorded or blank, so that you could record your own choice of songs. 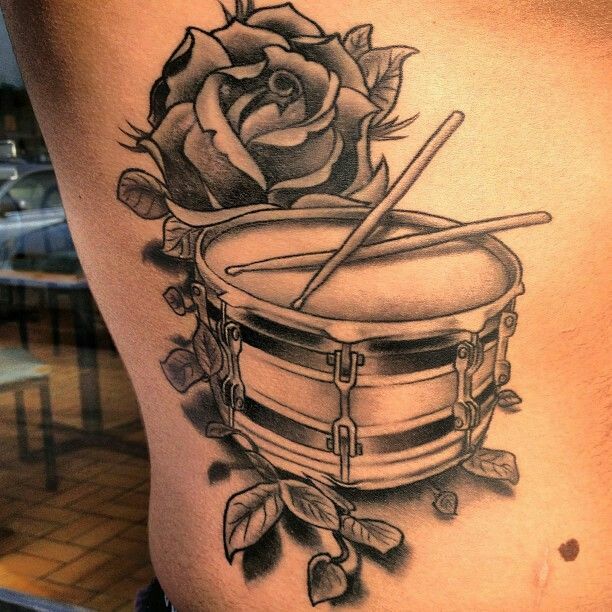 Drum: a simply constructed instrument with a long history, the drum is a very widespread tattoo design choice. For Native Americans, this image represents the heartbeat of Mother Earth. Heart-Shaped Bass and Treble Clef: if you flip the treble clef upside down, and then place it beside a bass clef, you’ll end up with a heart-shaped tattoo design. This clever configuration symbolizes one’s love for playing music. Gramophone: invented by Alexander Graham Bell, this old-fashioned music player represents innovation in music technology. 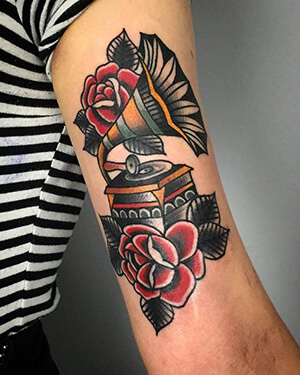 For those who appreciate the history and transformation of music through machines, the gramophone is a highly desirable tattoo design option. Guitar: a classic and well-loved instrument, the guitar is often represented in a tattoo design to pay homage to a musician or guitarist. These designs come in acoustic and electric guitar versions, and some of are even adorned with flowers or ribbons. Guitars can also express one’s passion for melody. 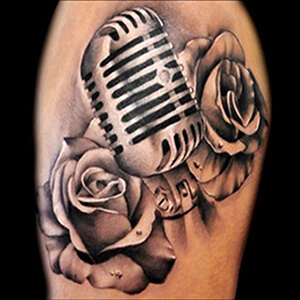 Microphone: this popular tattoo design is commonly worn by singers or those who enjoy singing. As a device that amplifies one’s voice, the microphone can symbolize empowerment or self-expression. 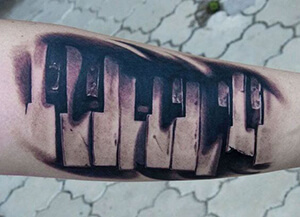 Piano Keys: represented by any number of white and black keys, this tattoo design is a first choice for those who love to play the piano. 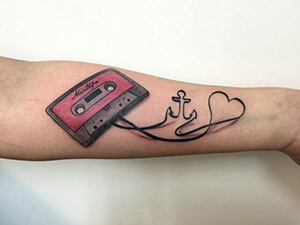 Playback Buttons: this tattoo design is based on the modern ipod or iphone design, which allows you to skip forward or backward between songs. Often placed on the inside of the wrist, playback buttons can represent self-control or nostalgia. Treble Clef: one of the most widely recognized symbols of musical notation, the treble clef represents one’s love for playing music as well as the universality of the language of music. 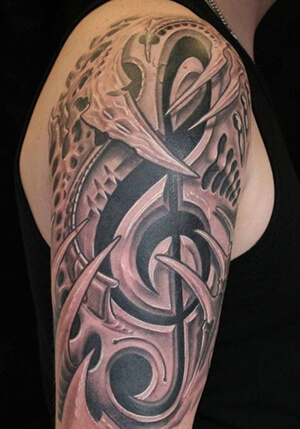 Love for music can be represented in a variety of ways, and musical tattoos reflect deep emotional connections to songs or instruments. 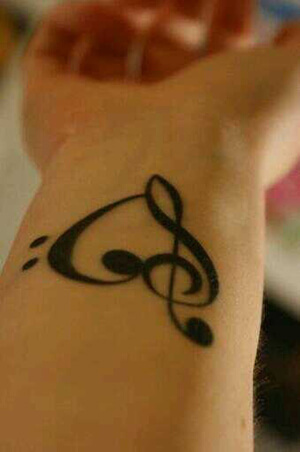 Since most of us who enjoy music rarely stop enjoying it, musical tattoos make a timeless choice. 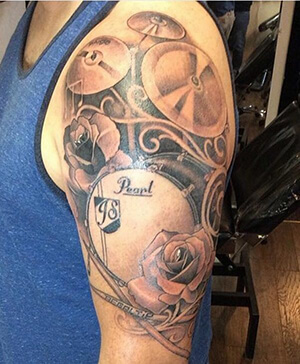 If you have any other musical themed tattoo ideas, let us know about them in the comment section below!